As diehard Treasury bond geeks, you gotta love the charts that accompany Treasury Borrowing Advisory Committee’s quarterly refunding report. As we contemplate the massive amount of debt that the U.S. has managed to pile up over the years, it’s worth taking a look at who’s been loaning us the cash. 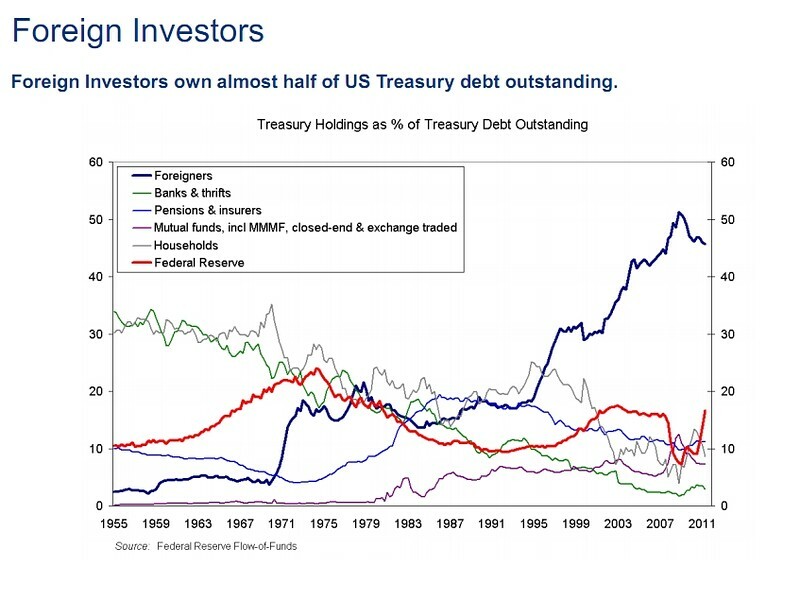 This chart goes a long way to answer that question, showing the major holders of Treasury debt over time. You have to note that rather sharp uptick in Fed holdings of Treasurys lately. (The red line.) But obviously the big story has been among foreign holders, whose lending to Uncle Sam has exploded over the last 20 years. The key question of course is why did foreign lending to the U.S. pick up so much in the mid-19990s. Well, some people would argue that this chart has a lot to do with it. This FactSet chart shows the exchange rate between the U.S. dollar and the Chinese Renminbi. It’s a little counter intuitive, but when the line goes up, the CNY is getting cheaper against the greenback. So you can that in early 1994, there was a large and sharp devaluation of the Chinese currency against the dollar, making Chinese goods way more competitive as exports. China devalued its currency, the yuan, to 8.7 yuan to the dollar from 5.8 yuan to the dollar on Jan. 1, 1994. More recently the Chinese government has let its currency appreciate against the dollar somewhat. But the U.S. wants a lot more. By the way, another way of looking at this whole debt issue is basically as the flip side of the U.S. trade deficit. The trade deficit started getting bad in the 1980s. But it really really got terrible in the 1990s and worsened up until the financial crisis. 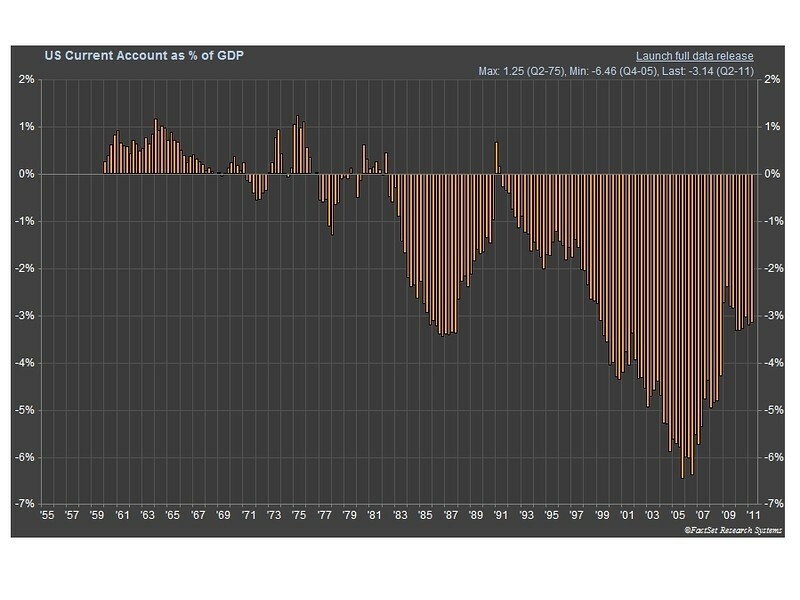 Here’s a look at the current account deficits, which measures mostly trade in goods and services and also includes transfer payments and investment income, as a share of GDP. Basically, this means we started selling a lot less than we produce. That means our trading partners were socking away massive amounts of dollars that we paid them. And largely they stuck those dollars back into U.S. Treasurys for safekeeping. That keeps the U.S. borrowing costs low, which makes it easy for us to rely on too much debt. At that keeps the whole corrosive cycle going.